One of the best things about the spring is the opportunity it presents to get out more - without having to battle darkness, freezing temperatures and all the other great features of a British winter. One fair that you've already visited or missed this month is the biggest of them all, the International Antique and Collectors Fair at Newark Showground. This usually attracts thousands of stallholders and although it has a reputation as a trade event, it's good place to go for anyone with the time and energy to explore what's on offer. If you went this time, what were your impressions of this major antique event? 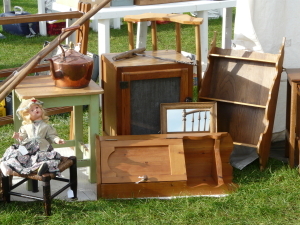 We try to provide reminders about many of the major fairs on the Perfect Pieces blog and always welcome comments on the blog from anyone who visits the fairs we write about. Was it busy, was there a good choice of stock, did you get stuck in the mud in the car park (as we did recently at Elsecar Fair!)? On that cringeworthy note, we wish you good weather and good hunting this month and look forward to a good summer!